How many years has he been saying he'll have a deliverable power-producing product within a year? It very much seems to be the case that he's a con man who is using a gish-gallop of shoddy math to hoodwink investors. It is possible to convince me otherwise - if he opened up to in-depth investigation, allowed others to study his experimental setup, or produced papers showing his methodology and experimental setup so others can replicate what he's done, and so on. So far all that we have to see is the results of limited study, like of heat output from the setup (with separate runs producing wildly different results), that doesn't tell us a thing about what's actually going on inside it. Like someone already wrote many pages earlier, this discussion is not going anywhere at all. We can dig up loads of falsehoods and inconsistencies in Mills' tome, but nothing seems to have any effect on believers. Even the entertainment value in looking for silliness has worn off at least for me. I don't think this discussion is worth continuing unless there's some real new development (changing the name of the company doesn't count as real development). There is no such thing as an expert on Bell's theorem. It would be like claiming to be an expert on 2+2=4. It is a very simple result that does not even directly involve quantum mechanics. It is simply a logical conundrum that places limits on any classical deterministic theory. In that sense it is aimed more at Mills' theory than quantum mechanics. The problem is you have achieved epistemic closure. You trust Mills. You will believe him despite nearly thirty years and tens of millions of dollars of failure. You will believe what Mills tells you about Bell's inequality despite the simple and obvious fact that you don't have the tools to judge. It's like I'm trying to discuss calculus with someone who is not an expert on 2+2=4. There are many places around the internet that will help you understand Bell's inequality. Blog posts, youtube videos, science forums, endless resources. What Mills has to say is not going to help. Break out of your epistemic closure by gaining an understanding apart from Mills. Anyone seen this youtube video yet? Looks like the same reaction going on in mills' device. The whole thing is pretty curious from an uneducated, wishful thinking viewpoint. Did you read the description on the youtube video? Yes, of course. The point im trying to make is that it does resemble the same thing going on with Mills' device. Why hasn't anyone come out and said "this is really whats going on, but nice try" if it is that easily dismissed. Let me ask you this. If you were to posses a technology which by its very existence would threaten your life, but it would also revolutionize the world. What would you do with it, if you were "this close" to making it work in your mind. Just saying, have an open mind. Why such the hostility towards even the least of credible ideas. If you don't like it you do not and shouldn't invest. On that note, I'd recommend buying at least a little bit of silver right now. Even if its all a pot of crap, You can still cash out for most of your money back on silver at any time. You may have read the title of the video, I'm saying read the description on the youtube video you linked to, where it says that it is a video of a BLP demonstration, so it doesn't just "resemble" it, it is one. This "technology" doesn't threaten Mills' life. That is absurd. The point many here are making is that it's not a credible idea. Exactly. Data leads theory, not the other way around. Good data generated by a hypothesis inspired by a flawed theory and which contravenes other flawed theories is still good data that should be understood and applied. The "more useful theory" in the context of the data is the "better theory" for the purposes of said data. Theory isn't important because it describes nature, its important because it permits hypothesis generation respecting testability and repeatability, at least in principle, which guides experimental design so we can understand nature better than before. The technology doesn't threaten Mills' life. Mills' business model is an open model so no enterprise, such as big oil or foreign interests needs to be shut out. I prefer to think it's not a credible idea because it's really such an incredible idea. His papers describe in exhaustive detail many experiments which a scientist skilled in the art could replicate. And some have. Also, if he were merely a 'con man' trying to 'hoodwink' investors, why is he using that money to pay for expensive facilities, equipment and a staff of more than twenty scientists, engineers and technicians? What con man does that? It could very easily be verified if this is a fake claim or real facilities by anyone interested. Also, if he were merely a 'con man' trying to 'hoodwink' investors, why is he using that money to pay for expensive facilities, equipment and a staff of more than twenty scientists, engineers and technicians? Because giving the impression of being a real operation is essential to keeping the money flowing. The pitch has always been that real world exploitation is just around the corner, backed up by flashy but scientifically irrelevant demos. That doesn't work nearly as well if it's just one guy with books full of dodgy math. And it works! Here you are, using the fact they spent some of that investor money on facilities and staff to argue that it can't be a scam! Never mind that putting up a convincing front is at the core of many investment scams. What con man does that? There are numerous examples of this in the "free energy" and "cold fusion" generas, though few as long running as BLP. I'm agnostic as to whether Mills is a con artist or a true believer, or to what extent those around him are one or the other, but the incoherence of his theory and BLPs pattern of behavior over the last 25 years strongly suggests either is more likely than "hydrinos" being a thing. If the founders of QM had had a better, Maxwell based reason for non-radiation, they would have used it and that may have led to an extended electron model something along the lines of Mills' model. ^ That is the most important sentence in this entire thread. which is a very reasonable™ assumption. FIG. 2I88 is a beast. FIGURE 2I88 is a schematic drawing of a thermophotovoltaic SF-CIHT cell power generator comprising dual EM pump injectors as liquid electrodes showing the generator support components in accordance with an embodiment of the present disclosure. It proves no such thing. 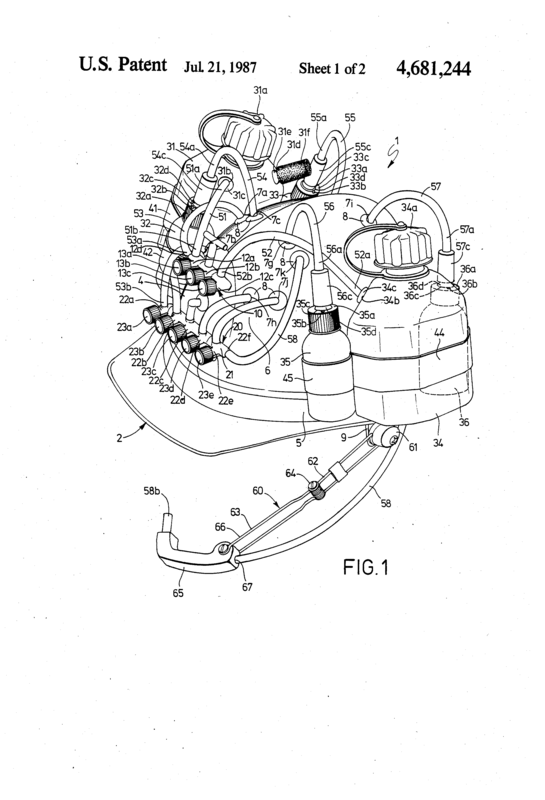 That figure pales in comparison to this behemoth (from US Patent 4681244). "In general we look for a new law by the following process. First we guess it. Then we compute the consequences of the guess to see what would be implied if this law that we guessed is right. Then we compare the result of the computation to nature, with experiment or experience, compare it directly with observation, to see if it works. If it disagrees with experiment it is wrong. In that simple statement is the key to science. It does not make any difference how beautiful your guess is. It does not make any difference how smart you are, who made the guess, or what his name is – if it disagrees with experiment it is wrong. That is all there is to it." †Assuming that anybody who co-authors a paper by Randell L. Mills is a True Believer, which is a very reasonable™ assumption. It's actually a terrible assumption. At best, it's an indication they probably didn't think Mills was a fraud (presuming they were not a party to it) or total crackpot at the time of publication. Co-author of papers reporting experimental results should not be assumed to buy Mills theory, and it should be remembered that some (like Jansson) were funded by BLP. There is a very long history of hucksters and cranks using patents to give their ideas an appearance of legitimacy. It's actually a terrible assumption. At best, it's an indication they probably didn't think Mills was a fraud (presuming they were not a party to it) or total crackpot at the time of publication. Co-author of papers reporting experimental results should not be assumed to buy Mills theory, and it should be remembered that some (like Jansson) were funded by BLP.